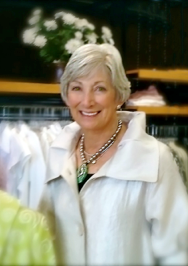 Mary Anne Wallace is the force behind Canal Clothing and has been dressing women to look their best since 1981. She pairs her excellent taste with dedication and infectious enthusiasm for fashion. Her philosophy is not what you wear but how you put it together. This has lead her to design an exclusive jewelry line for Canal Clothing. Stop by Canal Clothing and let Mary Anne or one of her experienced fashion consultants dress you in your most flattering signature style and learn our secret on how to lose ten pounds and 10 years instantly.